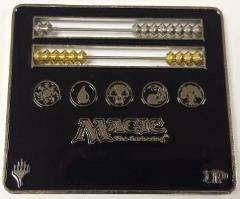 Quickly and easily count from 1 to 110 with the Abacus style Life Counter for Magic: The Gathering. Made with a zinc alloy and finished with a high-gloss black enamel, the Magic Abacus Life Counter features all 5 Mana Symbols. This item measures 3 1/2" x 4".